A return to unsettled weather but my first Swallow of the year shot past me heading north east over Aust Warth. 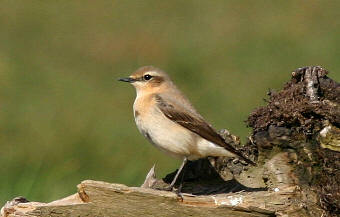 A much drier and brighter spring day produced my first 2 Wheatears of the year on Northwick Warth. They did their usual thing, perching up on the washed up logs. Other birds seen here included 5 Little Egrets and at least 12 Chiffchaffs. The wet and windy weather at Severn Beach continued to produce some good birds today. The day started and finished well for me with an adult Gannet seen in a 10 minute search on the way to work this morning and a first summer drake Eider, with a large number of Kittiwakes on the evening tide. Having to work for a living meant that I missed another 6 species here today that would have been year ticks; Arctic Skua, Great Skua, Swallow, Sand Martin, Willow Warbler and Wheatear, most of which should not be too difficult to see in the next few weeks. When I arrived home to Severn Beach from work this evening I had a quick scan of the estuary from an upstairs window and immediately saw 8 Common Scoter. I later joined two other birders sheltering behind the sea wall from the strong SW wind where we saw at least 550 Kittiwakes and my second Guillemot of the year. I received an early morning call this morning about a White Stork in a field just south of the Avon border. Unfortunately it remained in Somerset and despite taking a picture of it with Uphill Church (Avon) in the background it will not be added to my year list unless I see it again a little further north. 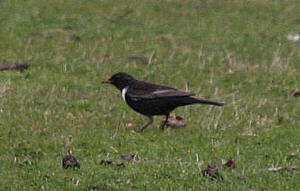 Later in the morning I managed to see an early male Ring Ouzel in Sheep fields at Aust Warth. Heavy rainfall in the afternoon did not deter me from seeing a large party of 68 dark-bellied Brent Geese on the tideline at Severn Beach, just a few hundred yards from home. 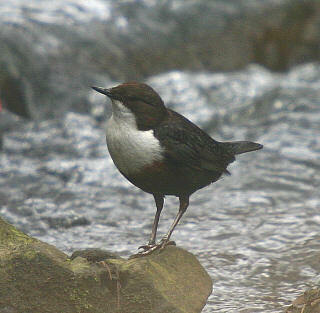 The weather remained unseasonably cold with no sign of any new spring migrants. I stayed at home on Severnside today and had the consolation of seeing the 5th ever record of Cetti’s Warbler here and 2 Short-eared Owls hunting over Chittening Warth late afternoon. After dark, I received news of a Kumlien’s Gull at Chew Valley Lake so I will probably pay the gull roost a visit later this week in the the hope that it returns. This afternoon I made the trek South to Chew Valley Lake to witness the formation of the spectacular gull roost. Many gulls dropped out the sky to face into the strong North East wind. An adult Yellow-legged Gull was found quite quickly. By the time the Nunnery Point hide was full, one observant birder found the the hoped for adult Ring-billed Gull amongst the thousands of Common Gulls and was seen by all present. All in all, well worth freezing for! 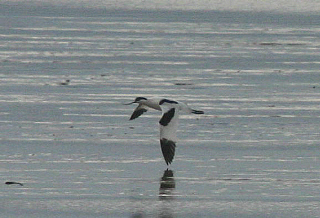 I gratefully received an email late afternoon about an Avocet seen feeding on the mud flats North of Oldbury Power Station at 11 o'clock this morning. 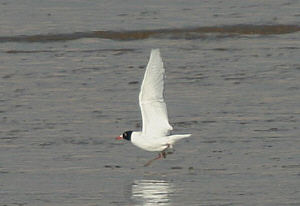 I managed to photograph it in the same place this evening at about 250 yards range, feeding and being chased by Common Gulls. A Little Egret was also present on the Northern Lagoon and 4 Stonechats were perched on the perimeter fence. A morning of snow and the first local patch Mandarins at Severn Beach. Feeling lucky, I had another attempt to see the Spotted Redshank at Portbury Wharf but we could not locate it. A female Goldeneye was seen on the new pool here, a Jack Snipe, 10 Snipe, 2 Stonechats and at least 15 Rock Pipits were found in the salt marsh. 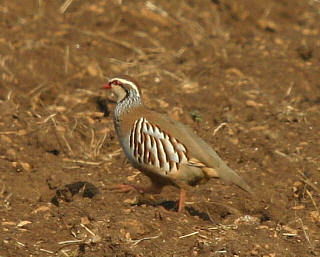 I made the most of a fine sunny morning to look for Grey Partridges near Marshfield. Despite visiting the “usual” fields I could only find 30 Red-legged Partridges, dozens of Yellowhammers and Corn Buntings, 10 Buzzards and a pair of Stonechats. On the return home I made the short detour to Willsbridge Mill, beteween Keynsham and Bristol. This was my first ever visit to this nature reserve and I soon found my target bird, a Dipper, showing very well upstream from the visitors centre. My first Kittiwakes of the year were seen at Severn Beach in blustery conditions late this afternoon. The flock would float up river until they reached the Second Severn Crossing and then fly a few hundred metres back down river to repeat the procedure many times. 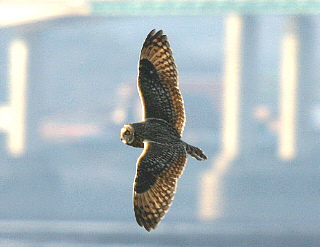 A pair of adult Peregrines attacked the flock on one occasion. The birds were still in the area at dusk and I counted from the warmth of my house at least 200 Kittiwakes plus a small number of Common and Black-headed Gulls together. If the wind continues, other sea birds might be found tomorrow. I made the short journey south over the M5 Avon bridge to visit the Portbury Wharf nature reserve today. There are some excellent, recently created wader scrapes and a large pool here. The chance of seeing the Spotted Redshank that has been present here for nearly 2 weeks was zero. On arrival, 3 “Power Rangers” were whizzing around the whole reserve on very loud off road motorbikes. I am sure the area will attract some good Avon birds later in the year and I will return with some earplugs! The day didn’t improve when I later failed to see an Egyptian Goose at Oldbury on Severn. 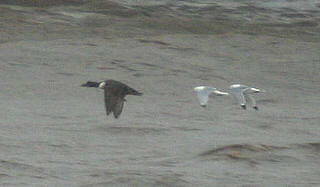 It apparently flew off north with 3 Canada Geese to land on the Gloucestershire side of the River Severn. A quiet few days with the local patch producing good views of Short-eared Owl again at Chittening Warth, a Water Pipit in the the Severn Beach salt marsh, an almost full summer plumaged Mediterranean Gull at New Passage and some spectacular high spring tides.